The team at Universal Audio are very pleased to announce the latest version of the UAD Software, version 9.8. This includes 3 new plug-ins for us to lust over. 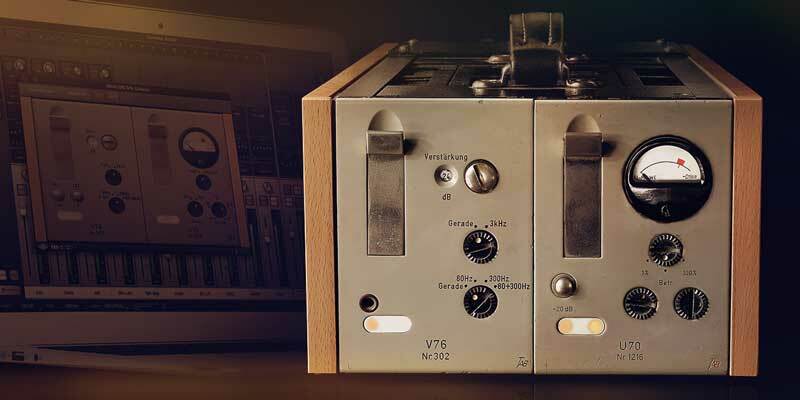 The V76 mic preamp is an accurate emulation of a true classic. The Diezel Herbert guitar amp plug-in by Brainworx is a heavy rock powerhouse of an amp emulation and Antares Auto-Tune Realtime Advanced takes real time pitch tracking and correction to a new level. In the world of heavy rock and extreme metal production there is no greater guitar amp than the Diezel's Herbert amplifier. It is a 180-watt pulverizer of an amp designed to deliver the meanest of means, the cleanest of cleans and is still considered a state-of-the art amp even after nearly 20 years in production. Anywhere bold, powerful electric guitar tones are needed, the top player reach for the Diezel Herbert. Developed by Brainworx and officially endorsed by legendary amp builder Peter Diezel, the Diezel Herbert plug-in emulates this six KT77-equipped sledgehammer, for UAD hardware and UA Audio Interfaces. Feels like a real amp when played through UA Audio Interfaces. Legendary for its vocal enhancing and creative applications, the Auto-Tune effect transformed vocal production in the late 90’s and 2000’s. From subtly tweaking a singer’s intonation to transforming a vocal into varying degrees of robot-speak, Auto-Tune is considered by many as a must-have tool for the modern music producer’s toolkit. A Universal Audio exclusive, the Antares Auto-Tune Realtime Advanced plug-in improves the previous UAD version with powerful workflow and sonic enhancements, making it the ultimate ultra-low-latency tuning solution for Apollo and Arrow interfaces. This update has been optimised for instant live vocal tracking in the studio or on stage with UAD Apollo interfaces. The V76 Preamplifier is arguably the most coveted standalone mic preamp ever made. Developed in the 1950s by the German Institute of Broadcast Technology (IRT), the V76's distinctly "hi-fi" tube sound was integral to legendary studios across Europe from the 1950s through present day, including Decca, EMI, and Abbey Road. The V76 Preamplifier Plug-In gives users the harmonically rich tube gain and classic frequency response of this iconic mic preamp in a great-sounding, easy-to-use emulation, exclusively for UA Audio Interfaces and UAD hardware. Perfect for nearly every source, from vocals, acoustic guitars, strings, drums, or bass. Each of the V76 Preamplifier plug-in's gain steps will gently shape sources, imparting a truly musical and classic tone. Owners of UA Audio Interfaces can now track through an iconic V76 preamp in real time, for an easy-to-use vintage analog channel perfect for any source. The V76 Preamplifier also supports Universal Audio’s Unison technology, giving UA Audio Interface users the V76 preamp’s all-important impedance, gain staging, and circuit behavior that have contributed to making it a recording icon. UAD hardware owners can also employ the V76 Preamplifier plug-in for mixing and tone shaping without ever leaving the box. UAD version 9.8 is available to download now from the Universal Audio website.